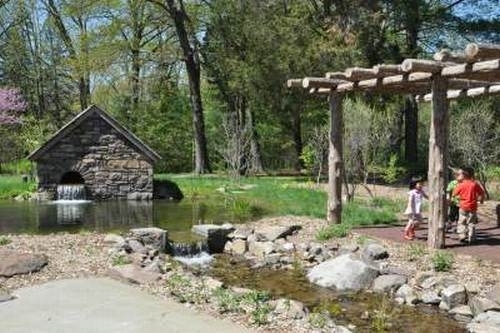 Discover the Secrets of Nature's Garden at Bowman's Hill Wildflower Preserve, a 134-acre site where nearly 1000 species of plants native to Pennsylvania and the Delaware Valley region thrive in naturalistic settings. Stroll on trails through woods and meadow, near a pond and creek on a self-guided or guided tour (offered seasonally). Enjoy native wildflowers, shrubs, trees and ferns, birds and wildlife throughout the seasons. Educational programs offered year-round. Shop for native plants and nature and gardening books and field guides. Visitor Center with exhibits, bird observatory, museum of mounted birds, nests and eggs, display garden and free information for home gardeners and naturalists. Check the web site for a calendar of events and programs. The pond is home to frogs, turtles, dragonflies and native aquatic plants. 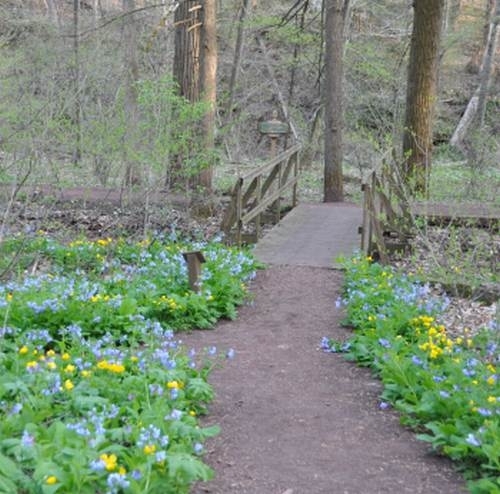 The Parry Trail in April with a carpet of Virginia blubells and wood poppies.